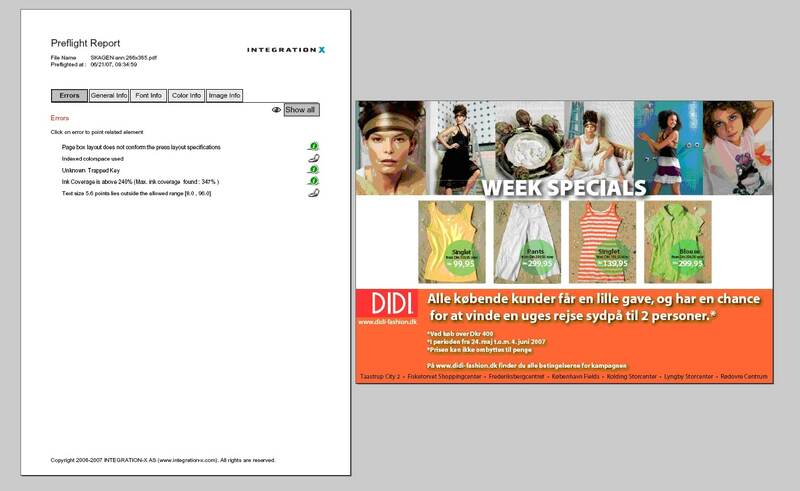 Integration X is a fast-growing Danish company developing workflow automation solutions for newspaper production. By integrating advanced technology with processes throughout the workflow, their ADWORKFLOW™ and OUTPUTWORKFLOW™ software solutions radically boost efficiency, improve quality and allow more time for meeting tight deadlines – while at the same time cutting operating costs and maximizing profitability. With rapid growth and a strong market position, Integration X has achieved the stability needed to continue developing their ADWORKFLOW and OUTPUTWORKFLOW applications which focus on two key areas in newspaper production: ad proofing and management; and editorial-to-press workflow. ADWORKFLOW is an intelligent solution for proofing and tracking digital ads, designed to streamline and automate the complex and often time-consuming process of achieving high ad quality. Typically, these systems support the upload of digital ads in both Encapsulated PostScript (EPS) and Portable Document Format (PDF). When problems in the uploaded ad are detected, the submitter is notified and must correct the problem in order to proceed. A typical newspaper could have hundreds of ads to place, and since most newspapers are published daily, the ad management workflow must be conducted in a quick and efficient manner. ADWORKFLOW is an ad proofing and management application which integrates with market-leading ad booking systems. The ADWORKFLOW server incorporates the Adobe PDF Library API and the Adobe Normalizer API to process and proof inbound EPS and PDF files. 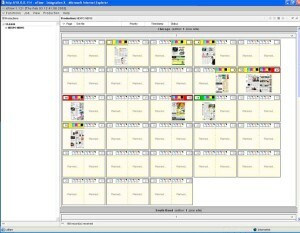 An intuitive browser-based GUI interface provides operators with an at-a-glance status of ad submissions. Any problems in the submitted ads are detected automatically and routed back to the sender for correction. Integration X developed an innovative approach to conveying error information, utilizing the layering capabilities of the PDF format to annotate the original ad with error information on a separate PDF layer. Once ads have been proofed, they are ready to be placed on newspaper pages. Ads are either placed alongside editorial content, or in some cases are placed with other ads in “all-ad” pages. 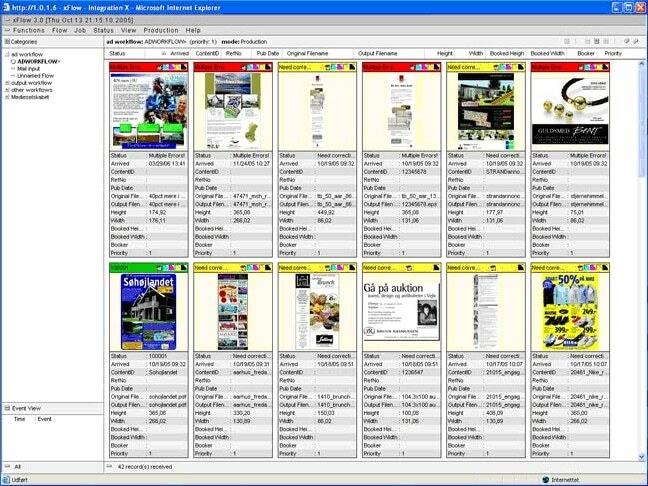 Content and ads can be region- or edition- specific; pages may be imposed 2-, and 4-up; content may be processed for output to print, e-paper, or web. Successful production systems support this entire gamut of configurability. The OUTPUTWORKFLOW server utilizes the Adobe PDF Library to place ad content directly on PDF pages without the use of an editorial system or manual intervention. A browser-based GUI enables editors to assemble and pair pages for production. Tasks are automated where possible, enabling the most efficient production of newspaper pages. 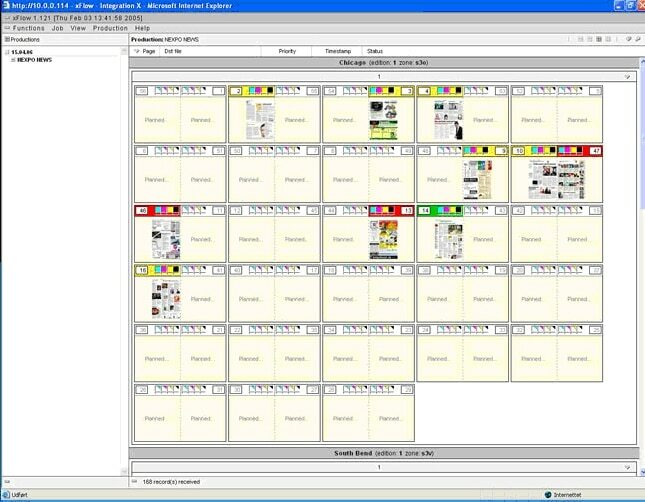 The initial version of ADWORKFLOW used a third-party component to provide some EPS and PDF processing capabilities. As their business grew, however, they began to run into problems that this component could not address. As a result Integration X was forced to allocate more of their own technical resources to resolve these problems themselves, in order to avoid impacting customers in production. The Adobe PDF Library is a programmer’s toolkit, developed by Adobe Systems, Inc and licensed and supported through Datalogics. It enables application developers to utilize the same PDF functionality used to build the Acrobat family of products.